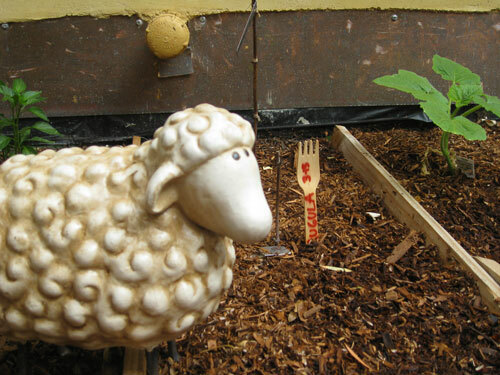 Look Who’s Waiting for the Veggies to Sprout! I set out some whimsical sheep and geese garden ornaments to give me something to look at while I wait for my culinary babies. The birds are scared of the ornaments too, so I have a built in scarecrow. What luck! “Mother Goose” waits on my Persian baby cucumbers called, “Green Fingers” from Renee’s Garden to sprout. I looked high and low for these small, crunchy cucumbers that are usually found only in farmers markets. This sheep was cheap! Only $2 dollars at the market in the “Easter Decor” clearance bin. How do you like my wooden spoon plant marker? I planted “Runway Arugula” also from Renee’s Garden. It is supposed to be slightly less tangy than regular Arugula, but same peppery taste! The sheep decor straddle my “square foot” wood dividers. Have you read the book, “Square Foot Gardening” by Mel Bartholomew? It is a clever planting method for intensive and effective yield of maximum vegetables in small square foot garden areas! A few weeks later when the veggies and herbs start to grow, the sheep and geese look like they are in a foraging field! As for me, I am in heaven. Shirley Bovshow’s Eden Makers’ Blog » Blog Archive » Garden Evangelist:Share Your Plants! I tasted your delicious veggies, they are a delight. Shirley Bovshow’s Edenmakers’ Blog » Blog Archive » Honk If You Grow Your Own Tomatoes! 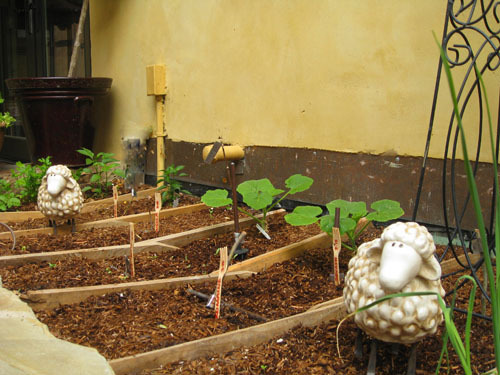 The square foot gardening method is a great way to grow more in less space. I was lucky enough to get to meet Mel in person at his condo (which is in Eden, Utah- a name that fits perfectly with this blog) and get some training one-on-one from him. It really is simple to do- once you get the beds built. My daughters and I have had a lot of fun planting the cut-and-come-again loose leaf lettuce varieties in our sq. ft. gardens. We just go out and clip off enough leaves for our dinner salad. It really is a great way to grow and it does work! Mel uses much of the proceeds from the book to take sq.ft. gardening to 3rd world countries where it does so much good in helping families feed themselves. We grow our veggies for enjoyment and taste but for those folks, it’s the difference between adequate and inadequate nutrition. I see, thanks for the clarification. Sounds like a great plan! Welcome LaLaLynn- You are correct about the 2″ layer of mulch being too much for the sun to penetrate. I should clarify. I mulched the seeded areas at 1″ deep with mulch and the rest of the areas without seeds at 2″ inches. I do not plant all of the square foot beds at the same time because I cycle my plantings so that I can have continuous veggies throughout the season. Example, I plant a square of carrots one week and 10- 15 days later, I plant another square with carrot seeds so that when I finish harvesting one square, I have another one to take over! 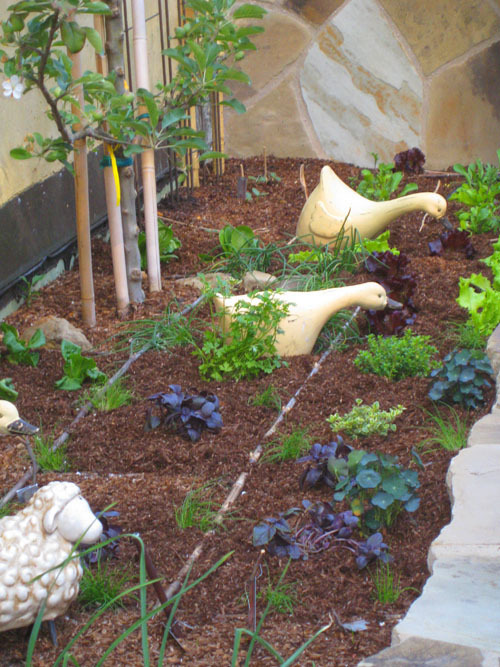 Square foot gardening looks delightful, now I’ve got to try this too! One question, how do the seeds sprout through the 2″ layer of mulch? I thought it had to be a bit thinner for them to get enough light… i.e. using mulch layers as a way to control unwanted weeds? Hi Lin. Square foot gardening is great, isn’t it? Your garden looks terrific! The “Square Foot” concept is great, I have his book, too. Like your ‘scarecrows’, also, though I think I need more than that with the hungry rabbits that inhabit my yard. They’re chomping on things they’ve never touched before, possibly because some of their area/food source is still recovering from last October’s fires. I noticed the forks right off and thought they were clever. I have got to label my plants this go round. I forget half what I know. It’s good to see you back up and running on the puter. I have seen the theory on raised beds and people keep giving me old windows so that might work. I was just given a bunch of lettuce seeds from botanicalseeds.com. I’ve got to get those in before the end of next week. 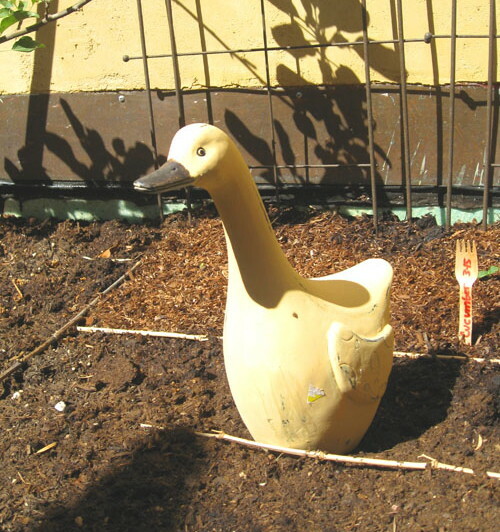 I don’t know what I have to put in my little garden to look as cute as your sheep and geese. I love that. Lots of oldtimers around here put out pie plates on a string so they clatter and catch the sunlight to scare the critters. But that’s not pretty at all. I’m embarrassed to say I thought the geese were real. 🙂 Great idea. Happy Earth Day! Square foot gardening, they had an article in the Sacramento Bee Garden section this weekend on this. My wife and I were just talking about how we remember seeing that concept on PBS quite a few years ago. Nice touch with the sculptures, good garden whimsy. I thought so too. Thanks Cinj. When I saw them I thought they were cute but had no where to put them in my house. Once I saw that they were made of water resistant material I immediately thought of the garden. Very cute! What a nice inexpensive way to add some interest to your garden.